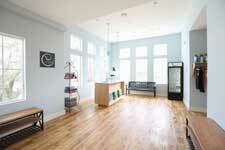 360 Yoga is the only Charleston area studio offering true Bikram style classes. And, we now provide more variety with Flow and Yin classes. We are driven by the core values of kindness, service and family. We are not corporate-owned, franchise yoga. We have been here for 10 years, and we will continue to offer a consistent product designed to sustain optimal health over the span of your life. We do not offer the latest fad class of the moment. Real, authentic yoga has been around for thousands of years. We are committed to staying true to this enduring practice. Our core belief is that the Bikram series — 26 postures and 2 breathing exercises — provides a unique balance of strength, flexibility, endurance and peace, such that a regular practice will maintain your health and vitality without injury. That’s a big statement, and we stand by it. The 26 & 2 is the foundation of everything we do. 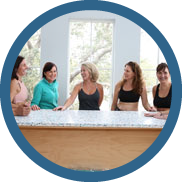 We plan to keep you feeling good, and keep you pleased with the service and function of your yoga studio … for the long haul. Our teachers provide professional, consistent and kind instruction. We have extremely low turnover: A huge percentage of our teachers and students have been teaching and/or practicing in our studio since we opened 10 years ago! We are an encouraging group that cares about both your long term practice goals, and how you feel today. We take the time to really know our students personally, and our students know each other. Our studio is always clean, attractive and well-stocked. We’ll get you set up with everything you need for class. Mats, towels, water, yoga clothes and other products are available. We have his and her locker rooms with private showers. Lockers and locks are provided, free of charge. If you are new to the practice, we’ll make you welcome and try to put your mind at ease as you step into something new. You’ve got to see our brand new studio! 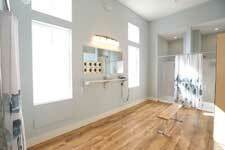 Our upstairs space is airy, private, and bathed in natural light throughout. In the Lobby you’ll find our friendly and helpful staff, a place to sign-in for class, cold water, apparel and other products for sale. We even sell several varieties of locally made kombucha! Whatever you might need to settle into class is here for you. And there’s ample space to visit and relax with other students. We are a supportive yoga community! 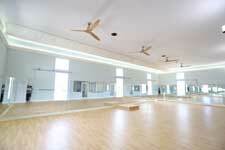 The yoga room is spacious, clean and peaceful. Mirrors on three sides aid you in your practice, helping you to achieve proper positioning and alignment. Our Taraflex Floor, a wood laminate with cushioned support layers, is kept fresh and sanitary for every class. The room temperature is set at 105° with 40% humidity for Bikram style classes, and approximately 10° cooler for Flow and Yin classes. Our locker rooms are equipped to serve your needs. The Women’s and Men’s locker rooms each have private showers, double sinks and changing areas. We also provide lockers and locks free of charge. The women’s locker room has 4 private showers, 2 toilets, and a large hair and make-up counter. All you need to do is show up. We have everything else you need, just waiting for you. We even have “loaner” shorts and tops in case you forgot something!